Who needs an algorithm? Here is The Vortex! 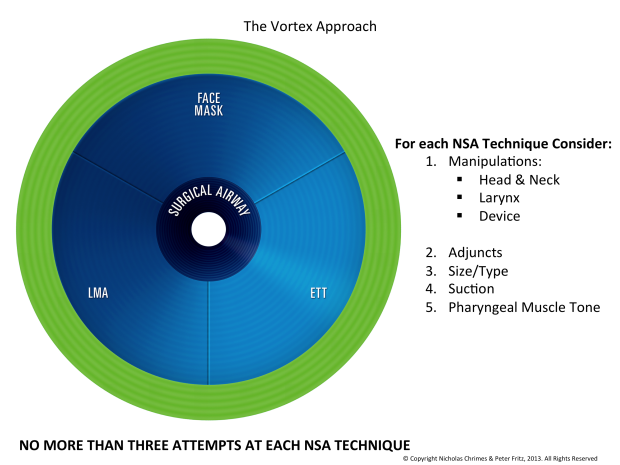 The Vortex is a simple cognitive aid that can be used in the setting of an unanticipated difficult airway. Conceived by Nicholas Chrimes (Melbourne anaesthetist) and Peter Fritz (Melbourne emergency physician), it aims to simply concepts, move away from complex algorithims, and be applicable in multiple settings. Key to the concept is that the key goal in an unexpected difficult airway situation is alveolar oxygen delivery. Techniques to deliver oxygen (LMA, ETT, face mask) are regarded as equivalent, as any of these, if successful, will move a desaturating patient out of the Vortex into the ‘green zone’ where oxygenation is adequate for a ‘time out’ and alternative planning to occur. At the centre of the vortex is a surgical airway. Here is a rarity – a video of a real-life surgical cricothyroidotomy in the setting of a failed intubation!